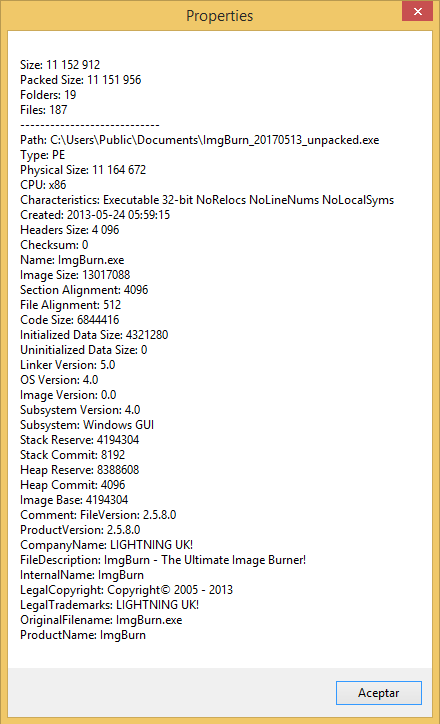 Earlier releases of ImgBurn 2.5.8.0 installer contains identical ImgBurn.exe file. This can be checked by extracting the ImgBurn.exe file from the installer (SetupImgBurn_2.5.8.0.exe) and unpacking it with UPX (upx -d -o ImgBurn_unpacked.exe ImgBurn.exe). Note that the hashes of unpacked ImgBurn.exe file from installer available as of 2017-05-13 match with the hashes of unpacked ImgBurn.exe file from installer available as of 2013-07-07. Note that the hashes of unpacked ImgBurn.exe file from current ImgBurn 2.5.8.0 installer do not match with the hashes of unpacked ImgBurn.exe file from earlier ImgBurn 2.5.8.0 installer releases (available as of 2013-07-07 and 2017-05-13). Both files differ in 15 KB. At first glance, we can think about being in presence of a recompiled ImgBurn.exe binary, but properties of both executables do not differ, even build date is identical (this can be seen by opening - with the "open inside" option - the unpacked binary with 7-zip and selecting the "info" option). Being the unpacked ImgBurn.exe binary not signed, this issue can pass without being noticed as no integrity checks can be done or enforced by the OS on the executable file. It is what it is. UPX's decompression isn't lossless afaik. The exe has been repacked with a newer UPX since its original release back in 2013... Back in June 2017 actually, which falls after the date of archive.org's copy of the exe.